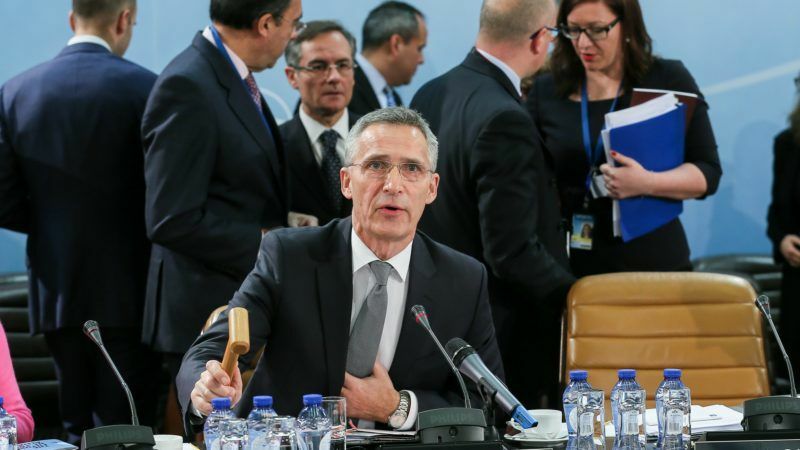 NATO today (12 December) reappointed Jens Stoltenberg as secretary general to serve until 2020, as the alliance undergoes its biggest revamp since the Cold War to counter the perceived threat posed by Russia. The former Norwegian prime minister, who took over in October 2014, will pilot the alliance into its next summit in Brussels in July with the North Korean nuclear crisis and US President Donald Trump’s apparent ambivalence towards NATO looming large. The alliance is making ambitious reforms to its command structures that aim to make NATO fit for the challenges of warfare in the 21st century — particularly the threat from cyber tactics and hybrid warfare. The North Atlantic Council, NATO’s main political decision-making body, said the 29 alliance members had agreed to extend Stoltenberg’s mandate to September 30, 2020. “Allies congratulate the secretary general and have full confidence in his ability to continue his dedicated work to advance NATO’s adaptation to the security challenges of the 21st century,” the council said in a statement. Former Norwegian prime minister Stoltenberg, 58, who took the job in October 2014, wrote on Twitter that he was “honoured and grateful” to have his mandate extended. “Looking forward to continue working together to strengthen the Alliance and keep our citizens safe,” Stoltenberg wrote. Honoured and grateful that the 29 Allies have decided to extend my term as #NATO Secretary General until end of September 2020. Looking forward to continue working together to strengthen the Alliance and keep our citizens safe. Stoltenberg took the helm as the Ukraine crisis raged in the wake of Russia’s annexation of Crimea, and he has overseen the deployment of four combat-ready battle groups to the Baltic states and Poland to counter Russian assertiveness. Some 4,000 troops have been posted, along with tanks and equipment, in NATO’s biggest European deployment since the end of the Cold War which aims to let the Kremlin know NATO is ready to defend its members in the event of attack. British Prime Minister Theresa May welcomed Stoltenberg’s reappointment, saying he had been a “true champion” of NATO. “He has made sure that NATO has stood strong but not stood still, meeting Russian aggression in eastern Europe while reforming to face developing threats such as cyber-attacks and hybrid warfare,” May said in a statement. RT theresa_may "RT Number10gov: PM: Secretary-General Stoltenberg has been a true champion of the #NATO Alliance. I am delighted that the Secretary-General will now have the opportunity to build on this and I look forward to continuing our strong par… pic.twitter.com/u4zHTsG0wp"
Last month NATO defence ministers agreed to increase the use of cyber weaponry and tactics during military operations and to create a cyber operations hub as the alliance faces hundreds of attacks on its networks every month and fears grow over the Kremlin’s electronic tactics. Next year’s summit is also set to forge ahead with changes to NATO’s command structure, stripped back after the Cold War but now being expanded with the revival of a centre overseeing Atlantic shipping lanes. The alliance is also keen to further boost cooperation with the European Union — already significantly stepped up under Stoltenberg — to make it easier to move troops and equipment around Europe. The growing nuclear threat from North Korea also casts a shadow over the alliance, after Pyongyang tested a ballistic missile earlier this month which it said brought the whole of the continental United States within range.